After a lengthy summer hiatus, we're back! Our feature this month centers on a relatively new addition to our collections, and item from the newly opened Zell Miller Papers. In 1987 Billy Payne, a successful Atlanta attorney, first conceived of bringing the 1996 Summer Olympic Games to Georgia. A graduate of the University of Georgia, Payne hoped that this opportunity would give the city a positive new image. He recruited mayor Andrew Young and together the men developed a proposal to sell local business leaders on the idea. In September of 1990 they pitched an extensive bid document to the International Olympic Committee. Nine years and several billion dollars of infrastructure later, the Olympics landed in Georgia. The Olympic Flame, which commemorates the theft of fire from the Greek gods by Prometheus, has been a symbol of the Olympic Games since their beginning in ancient Greece. The modern torch relay used to deliver the flame from Greece to the host city, however, only began at the 1936 Olympics in Berlin. That first relay lasted twelve days and included 3,000 torch bearers. By the 21st century, the relay had become an economic opportunity, a series of media events sure to drum up interest for the Games in the host country and around the world. 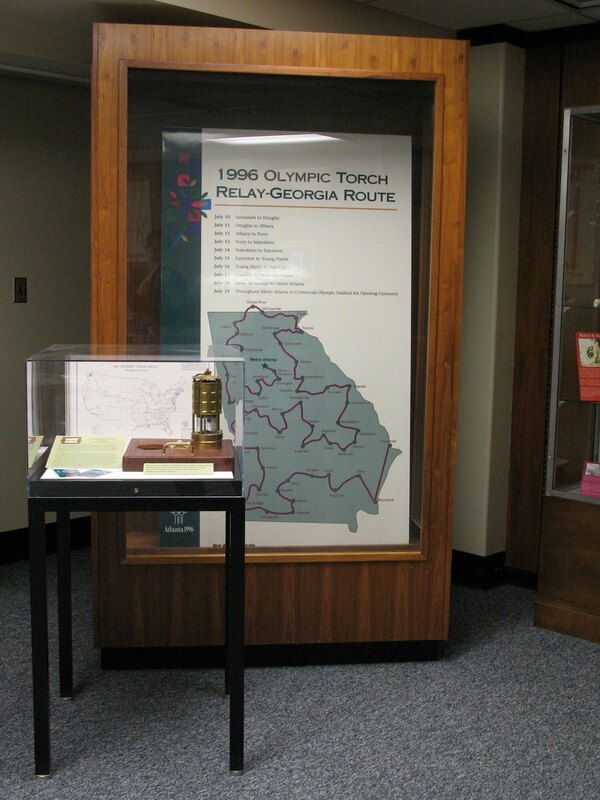 In 1996, the torch relay from Los Angeles to Atlanta lasted 84 days and included 10,000 torchbearers. The torch traveled by foot as well as by bike, seaplane, train, and steamboat – more than 15,000 miles through 42 states to its final destination. Research projected that the relay event would reach more than 180 million citizens and 34 of the top media markets in the country. On July 19, 1996 83,000 attendees watched as famed boxer Muhammad Ali served as the final torch bearer, delivering the flame to Olympic Stadium in Atlanta. 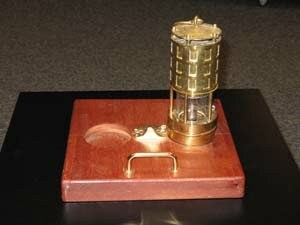 This lantern, used to transport the flame from Greece to the United States, was given to Governor Zell Miller. The matching lantern was given to Billy Payne. This “Outside the Box” object will be on display in the lobby gallery of the Russell Library, open 8:30 am – 4:30 pm, Monday through Friday, until September 30th. For further information on this feature, or the Zell Miller Papers, please contact russlib@uga.edu or visit http://www.libs.uga.edu/russell.